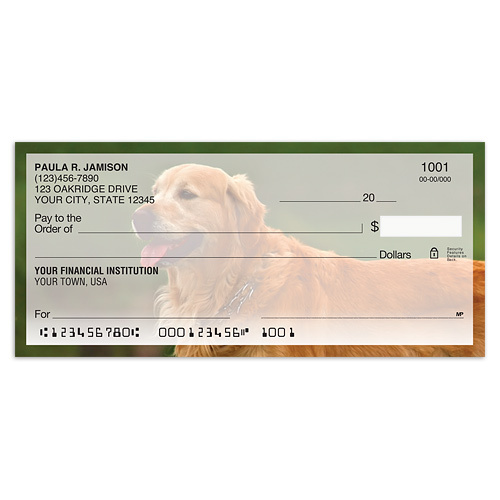 These Golden Retriever Personal checks are personalized with your name, address, bank name and account number so they can be used with any U.S. checking account. Pricing is about the same as - or in many cases less than - what most banks would charge for reorder of their generic check styles. Most of our checks are available in your choice of single or duplicate formats. Matching checkbook covers and address labels are also available with most of the check designs featured here. By artist Howard Robinson. GOLDEN RETRIEVER Rugged water-loving dogs with a generous loving nature. 4 alternating images of a golden retriever enjoying a day at the park. His friendly demeanor makes him a family favorite. Photography by Faith A. Uridel. Simply adorable, the Golden Retriever Checks capture the happy-go-lucky spirit of the Golden Retriever with 4 photo scenes of this wonderful dog breed. Matching labels are also available. Order your Golden Retriever personal checks today! © 2018 Cool Dog Checks ~ Dog and Animal Personal Checks, Checkbook Covers, and Address Labels.